Depp! Charge! Hollywood's Most Unlikely Megastar Interviewed! Johnny Depp is the quintessential Hollywood heartthrob: chiseled, buffed and prime blockbuster material, except for one essential difference—he has never sold out to the Hollywood machine. After raising just a few eyebrows in Wes Craven’s brilliant A Nightmare on Elm Street, the young Don Juan rose to fame as a teen heartthrob in adolescent TV drama 21 Jump Street (1987), quickly earning the status of a blossoming pinup, hyped and ready to leap into a movie career playing romantic leads and action heroes. Johnny however had other ideas. In 1990 he teamed up with cult director Tim Burton to take the lead in Edward Scissorhands (the movie role which made him super famous) and as a result strayed from his destined movie star course. Instead of earning respect as a pretty boy love interest Johnny had set himself a different precedent, proving he was even better at playing the freak. His excellent relationship with conceptual filmmaker Tim Burton also helped Depp concentrate on movie roles that had little to do with his good looks, a factor Depp often disguises. The young actor also decided to avoid the big bucks and opted to star in films which promoted him as a character actor and, dare I say it, a complete and utter nutter. In fact Depp’s greatest successes have been realized when he embodied characters with dubious mental faculties; Ed Wood, Edward Scissorhands, Raoul Duke (Fear and Loathing) and Captain Jack Sparrow to name a few of his best-loved celluloid creations. The result is Johnny has successfully managed to avoid his movie star potential to gain a reputation as a serious actor (there’s a big difference). He has also abandoned US culture and currently lives in France with his long-time missus (Vanessa Paradis) and two children Jack (1) and Lily-Rose (4). Along with enjoying the complexities of French society and perusing his musical aspirations, Depp is also becoming increasingly well known for his antagonistic opinions towards American culture and has spoke out on frequent occasions against the US government and the immature politics of his country. His actions and opinions have not only given Depp credibility in his career but also secured him the legacy of being an actor who can actually think for himself. When you got the role your daughter ran around saying ‘My daddy’s a pirate.’ Was one of the reasons for doing Pirates of the Caribbean that it meant making a family film? Yeah. One of the initial ideas was that it was a film that was a bit more accessible for my kids, slightly more so than Fear and Loathing in Las Vegas or Ed Wood. 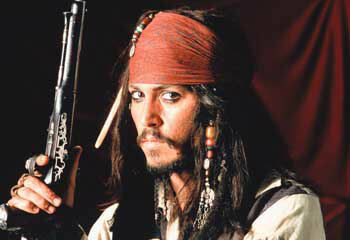 Put a guitar in the hands of Jack Sparrow and he could be in Guns ‘n’ Roses . . .
That’s interesting. I never thought of that. 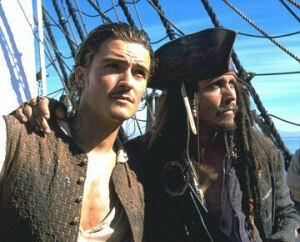 But I always thought of pirates as the rock ‘n’ roll stars of the 18th century. I kept wondering about pirates and stuff and thought it would be very easy to do the swashbuckling kind of thing, the classic kind of angry pirate. But it seemed to me that more than just pillaging and plundering, stealing and killing—all that kind of stuff—another element that must have been very important to these people was myth, the legend. Because you want that to arrive before you do. Whatever it is you want them to feel you want to arrive at that first . . . kind of like a rock ‘n’ roll star, whether it’s the fear or the excitement or the awe or whatever. So I felt that this would be a guy who, more than anything, would want to propagate that myth. Pirates were like rock ‘n’ roll stars . . . moving forward, carefree. But in terms of being careful of what you choose are you aware of your legacy as an actor? Absolutely. It was certainly a conscious decision early on when I was able to be set free from the confines of television. I wanted to be able to make films that maybe some day I could be proud that I had done and that maybe my kids or my grandkids could be proud of some day. Sure, that stuff is very important. Is acting still challenging and enjoyable? It is still challenging, absolutely. I actually think that I enjoy it more now because now I know what’s important and what’s not important. It’s been quite a while now since I stopped watching new movies and I don’t read newspapers or magazines and don’t watch all the television shows. So I don’t know who anybody is, I don’t know who’s popular, who’s not. I don’t know what movie made a billion dollars and what made a nickel. I’m ignorant, with regard to the business. All I know is what I do. I know what my work is, I know what the process is and I have a great time living like that. Why did you decide to cut off all these things? Because it was like a ship that had acquired a zillion barnacles, these things that slow you down in the water and eventually will rot the wood and eat away at you. It’s difficult enough just moving forward every day, so why allow these obstacles to run your life? The greatest thing is to just not care about any of it. That’s just the greatest thing in the world. Because then it just becomes about me and my work and I don’t worry about success or failure. Is that what you want to teach your kids, not to care? It’s ok to care about your work and be passionate about it, certainly. That’s great but I think it can be very unhealthy to care about what other people are doing. Maybe early on Picasso and Matisse egged each other on but when true cubism arrived I think it came because Picasso had blinders on. He was just thinking about his work and his work only. Not that I would compare myself with Picasso, in any way! It’s just that he is a guy I admire greatly. What are the benefits your children get from being brought up as Europeans? And as a father are you starting to think how you’ll handle it when guys come for dates? The benefit my children have growing up in France, because we spent months in London as well as living in France, is old, solid culture. Not like American culture which in a lot of ways is like a young puppy . . . a little bit dumb, a little bit cute. In terms of the dating thing, I worry about that. I have these ideas that I will just be waiting with the tire iron and just snap his knee. Kids coming in early hours, don’t know whether to wait up or go to bed . . .
Yeah, I know. They grow up real fast. I’m in big trouble. Guilt is probably the best thing, I’ll just guilt them. How could you do this to daddy? It doesn’t work? I’ll try something else then? Join the club of DADD—Dads against daughters dating . . .
That’s excellent. I must have a T-shirt! At home when you aren’t working you just chill with a nice glass of wine, cheese and bread? All that. All the stuff that Francois Villon did, centuries ago. Simple stuff. That’s really what is afforded me, simplicity, which really wasn’t available before out here. There is no simplicity out here; everyone is in the business. I would like to direct again if I don’t have to be in it. I found that a little bit difficult, stifling. Directing and acting are two things that are very opposed to one another. The problem with me is maybe I would like to do something that maybe didn’t have a linear story or formula. I’d like to do something that makes absolutely no sense at all. Just put a series of images together with music. Would you like to work with Robert DeNiro? Yeah, he’s great. He is very special, an amazing actor. I’d love to work with him. I think I might be doing something with John Malkovich later this year. I’ve been to his house and he forced me to drink some really good wine. What about working with Vanessa? I would love that. It would be the ideal situation; we could both go to work in the same car with the kids and everything. It would be all right. Johnny Depp has over the last 20 years become synonymous with surrealist fantasy director Tim Burton, starring in three of his most celebrated movie outings, Edward Scissorhands, Ed Wood and Sleepy Hollow. In order to forge the actor/director relationship still further, Depp is set to star in Tim Burton’s much hyped new movie, an adaptation of Roald Dahl’s classic children’s tale Charlie and the Chocolate Factory. What is even more exciting is that Depp is marked to play the eccentric chocolate factory proprietor Willy Wonka, beating out such healthy competition as Christopher Walken and Michael Keaton. Charlie and the Chocolate Factory is set to begin filming next year for a 2005 movie release.